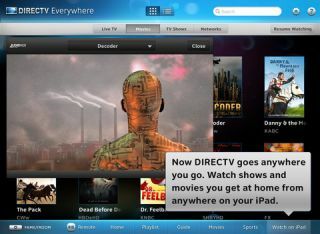 Cable giant DirecTV has removed some of the shackles from its iPad app, by allowing limited content to be streamed outside the home. The company's mobile application had previously required subscribers to be connected to their home Wi-Fi network in order to access live TV streaming and video on demand. DirecTV Everywhere, as the update has been coined, will now allow users to access certain video outside the home, but live television is still a no-no. The app adds the likes of HBO Go, Starz and the Sony Movie Channel into the mix, while also opening up content from the DirecTV Audience Network. More channels may be added shortly. The app is also more social than ever before, bringing the likes of Facebook, Twitter, Miso and GetGlue on-board to help fulfil its remit as a second-screen companion. It'll also help the company's subscribers discover shows that are popular with other users. Check out this early hands-on from the Solid Signal Blog.